New York : Yearling, 2006, c2002. 292 p. : col. ill. ; 20 cm. Roy, who is new to his small Florida community, becomes involved in another boy&apos;s attempt to save a colony of burrowing owls from a proposed construction site. 100 ME:PersonalName 1 $a Personal name Hiaasen, Carl. $c Statement of responsibility Carl Hiaasen. $c Date of publication, dist, etc 2006, c2002. 520 Summary $a Summary, etc. note Roy, who is new to his small Florida community, becomes involved in another boy&apos;s attempt to save a colony of burrowing owls from a proposed construction site. Hoot is a good book to read and if you like owls and caring. There are three kids that care about these owls that have burrowed their homes in the ground. There is this new building or restaurant business being built on that property. The owls propably won&apos;t leave because that has been their home for years....how would you feel if someone threw you out of your home.. not good huh? So these kids are life savers and save the owls from being plowed out and killed. Now that&apos;s a real life saver. Hoot is a wonderful book about how important the enviorment is.Its very amusing how mullet fingers comes up with crazy ideas about how to sabotoge the construction workers. 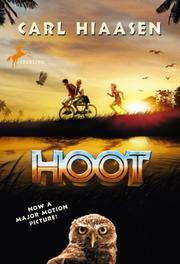 Hoot is an excellent book to demenstrate how important the enviorment is.